Every week a different FADER staff member will pick a clothing item or accessory that he or she has lately been spending a lot of time with—or would like to—and write a little love letter to it. We would’ve done a column on who we’re dating but that seemed a little bit much. 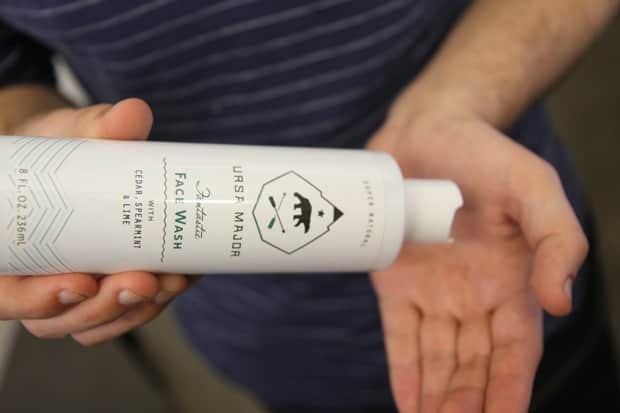 This week Alex talks about Ursa Major’s Face Wash.
Just because I'm writing about face wash does not mean I'm going to give you tons of beauty advice. Not my thing. If you want really great beauty tips, go check out Cat Marnell at XOJane.com, who I think is doing some of the weirdest, most modern and complicated writing on the internet, all on the subject of health and beauty. She can write well about lip liner one day and a super sad confessional about her own ongoing drug addiction and the death of Whitney Houston the next. But that's life! We're messes, most of us, stuck with ups and downs. If you want a window into the reality of our generation's wellness in the 21st century, she's your girl, a person who understands both the good and bad sides of desperately trying to look and feel your best. As much as I like Cat's writing, her beauty reports bring to mind some unhappy truths. New York is tough on all of us, excuse the cliché. When I first moved here, I was shocked by how good everyone looked, alternately excited and depressed to be surrounded by such beautiful people in such beautiful outfits. I'd leave parties at 4 AM with smiles so big they hurt my face or shoulders sulked to the ground. I'd drink too much, smoke too many cigarettes, all to calm my social insecurities, and then go right to work with a bottle of Gatorade the next morning. I'd have crushes on people that looked so good, that got their hair cut once a week and had money for the fancier versions of clothes I always bought at thrift stores. I couldn't turn away from this beautifully art-directed reality, a city that seemed costume designed and photoshopped. While that New York pressure has turned Cat Marnell into a beauty machine, in the four years that I've been in New York, I've learned some lessons and reversed some of that trajectory. I care less and less. Since the competition is so high, I figure that the only safe bet is to compete as little as possible since you're bound to lose so many of your battles. My beauty regimen? Wash my face once a week, put on under-eye creme and a light moisturizer. No spas, no massages, no acupuncture, no juice fasts. Ursa Major's face wash is the physical metaphor for who I've become. It's simple and low maintenance, but it does the job well, unencumbered by a million ingredients and tricks of the trade. It's just cedar, spearmint and lime. That's it. But you know what? That kind of simplicity is refreshing, feels like the iciest blast of cold water on my face. My face feels bare and clean when I'm finished, not mucked up with superficial ephemera and bells and whistles. I can't say for sure if it will prevent wrinkles or keep me looking twenty-five for the rest of my life, but perhaps its greatest effect is that it feels so good I don't even care.